Written on front: "Majestically winging its way west, Pan American World Airways' first China Clipper, the Martin M-130 flying boat, launches pioneer transpacific service in 1935. Forty-five years later, history is repeating itself. 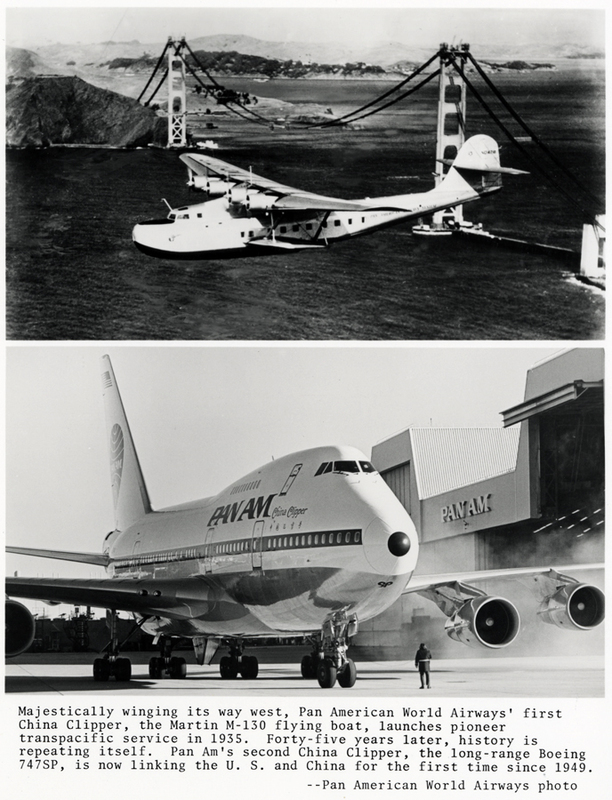 Pan Am's second China Clipper, the long-range Boeing 747SP, is now linking the U.S. and China for the first time since 1949." “Pan American World Airways' first China Clipper, Martin M-130 in service in 1935, and forty-five years later, its second China Clipper, Boeing 747SP,” UM Libraries Digital Exhibits, accessed April 22, 2019, http://scholar.library.miami.edu/digital/items/show/661.